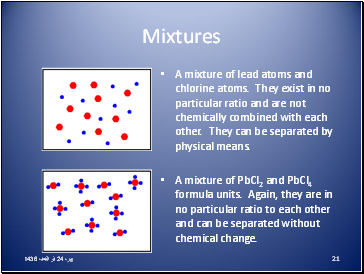 A mixture of lead atoms and chlorine atoms. They exist in no particular ratio and are not chemically combined with each other. They can be separated by physical means. A mixture of PbCl2 and PbCl4 formula units. Again, they are in no particular ratio to each other and can be separated without chemical change. They can be mixed in any ratio. 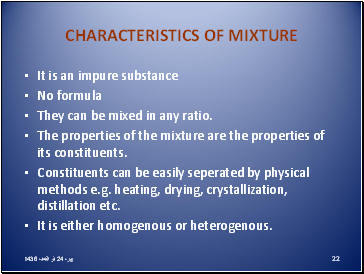 The properties of the mixture are the properties of its constituents. Constituents can be easily seperated by physical methods e.g. heating, drying, crystallization, distillation etc. It is either homogenous or heterogenous. 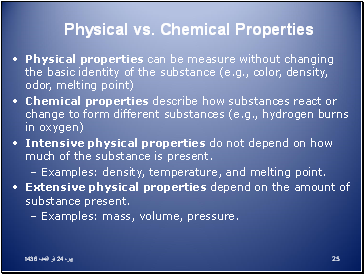 Intensive physical properties do not depend on how much of the substance is present. 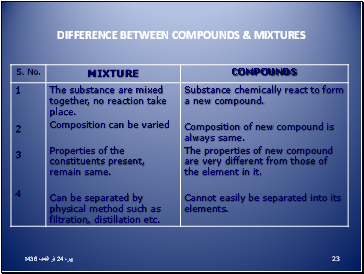 Examples: density, temperature, and melting point. 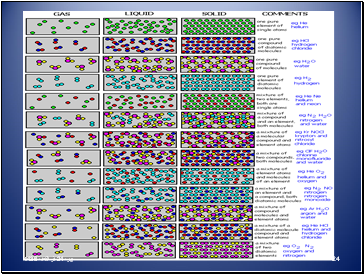 Extensive physical properties depend on the amount of substance present. 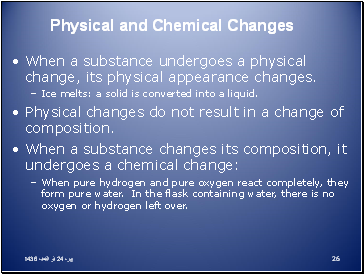 When a substance undergoes a physical change, its physical appearance changes. Ice melts: a solid is converted into a liquid. Physical changes do not result in a change of composition. When pure hydrogen and pure oxygen react completely, they form pure water. In the flask containing water, there is no oxygen or hydrogen left over.